Assured Automation’s SM Series motorized ball valves are two way quarter turn ball valves with a compact “Sure Mount” electric actuator. There are two distinct types of ninety degree rotary actuators available. 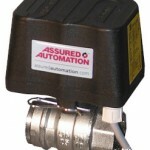 One is a basic on/off unit where the valve is either fully open or fully closed. The other is modulating and can be accurately positioned anywhere between 0 and 90° using a control signal. The on/off units are fast acting with an actuation time of five seconds. They are available with nickel plated or lead free brass ball valves. Assured Automation offers a variety of lead free brass products including manual and automated ball valves, check valves and flow meters. The modulating units operate much more slowly and come with or without flow optimizing discs. This makes them perfect flow control valves for HVAC applications. The purpose of the flow optimizer is to make the flow rate increase evenly in direct proportion to the rotation of the ball. These curves clearly illustrate the principal. See how the percentage of flow on the valve with the optimizer disc increases at a steady slope as the ball rotates. Whereas on the valve without the optimizer there is a sudden increase in the middle and not much change near the fully open and closed extremes. This provides precise control for applications like mixing water on heat exchangers. The most prominent feature that both of these actuator types share is the quick and easy “sure mount” mounting system that connects them to the “sure mount” valve stem. But don’t be fooled by this tiny locking pin, the use of minimal hardware in this simple design still provides a reliable connection of the actuator to the valve. To remove the actuator, simply pull out the locking pin and pull off the actuator, its that easy! Once the actuator has been removed, the Sure Mount valve can be manually operated using a standard screwdriver. The slot in the valve stem is always parallel with the ball drilling providing a reliable indication of the ball’s position at anytime. To replace the actuator, first make sure the actuator drive tab and the valve stem slot are in the same orientation. If they are not, rotate the valve stem with a screwdriver to align, then press the actuator onto the valve stem. Next, simply replace the locking pin on either side. There’s a reason this valve is rapidly becoming a favorite in the HVAC industry, it’s a great valve at a great price! This entry was posted in Latest News, New Product Announcements and tagged brass ball valves for HVAC, HVAC Ball Valves, modulating ball valves, motorized ball valves for HVAC, SM Series, sure mount ball valve. Bookmark the permalink.